By Elisha Anderson, Detroit Free Press. Photos by Ryan Garza, Detroit Free Press. Behind the brick walls of a nondescript building in Chesterfield Township, a treasure trove of automotive history awaits. Shiny cars in candy-colored shades of reds, blues, greens and yellows sit side by side, row after row inside this oversized garage. Some date back more than 100 years. For a just few hours each week, the public gets a glimpse inside the 45,000-square-foot building that’s home to 91 cars, including a sought-after Tucker Torpedo, one of only 51 ever made. Ted Stahl, the executive chairman of an international group of companies based in St. Clair Shores, has amassed so many vehicles — with brands including Auburn, Cadillac, Chevrolet, Chrysler, Cord, Duesenberg, Ford, Oldsmobile, Pontiac and Packard — that his garage doubles as a museum. Inside, there are bulging wheel wells, thing vertical grilles, wood panels, whitewall tires, built-in flower vases and even vehicles that have been featured in movies. Some of the cars greet visitors with their hoods popped. Others have their tops down. Most have no barrier preventing people from getting close. The cars, each ranging in value from five figures to seven figures, are surrounded by vintage gas pumps, porcelain steel and neon signs, some with the names of automakers. Car lovers, history buffs or those just curious can see the collection firsthand 1-4 p.m. Tuesday afternoons and 11 a.m.-4 p.m. the first Saturday of the month. 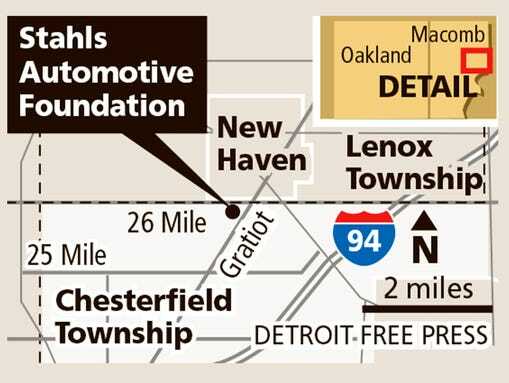 There is no charge to enter Stahls Automotive Foundation at 56516 North Bay Drive, near 26 Mile and Gratiot. Volunteers are eager to answer questions and explain innovations on the vehicles while learning from the visitors in the process. “This is a hidden gem,” said Fred Regan, who is among a dozen volunteer guides at the museum. Memories came back to Ray Gleason as he looked at the vehicles earlier this year. During his visit, the 67-year-old from Emmett peered under the hood of red 1964 Chevrolet Corvair Monza Spyder convertible. He said the car was like the one his son bought in 1987, but a year older. They took the engine out of his son’s car together, carried it to the basement, rebuilt it then reinstalled it, Gleason recalled. “It’s hard to believe you can have this many cars worth this much money in one spot,” Gleason said. Motorcycles, trucks, a boat, a fire truck, an ice wagon and a stagecoach are also part of the collection that includes a Big Boy exhibit in the corner. It’s a lesson in history walking through the building, with vehicles arranged chronologically starting with a 1899 De Dion-Bouton Tricycle. He got his first collector car about 25 years ago — a 1930 Ford Model A Roadster Deluxe — then gradually began investing in other unique cars, learning more and more about different types along the way. Most of the cars in his collection still run. “The museum itself has taken on, amazingly, a life of its own,” said Stahl of Grosse Pointe Woods. John Lauter works there full time and said it sometimes has what he calls “Christmas mornings.” On those days, a new addition, sometimes additions, arrive. One of the stars of the collection is the rare 1948 Tucker, which is “powered by a rear-mounted, converted helicopter engine” and has a center-mounted headlamp. Another is the 1934 Duesenberg Model J. Information posted on it said the car cost $10,000 to $20,000 during a time when a new Ford was less than $600 and the average American home was $4,000. “It was for a pretty exclusive clientele,” Lauter said, adding movie stars owned them. The yellow Winton built for the 1969 movie “The Reivers” and the Whoville Family Sedan from “How The Grinch Stole Christmas” are also displayed. In addition to the cars, about 20 musical instruments are at the museum. A Wurlitzer theater pipe organ, made up of more than 1,500 pipes, is running after several months of work on it. Some of the time, music plays as people look at the cars and there is a nearby music room displaying other instruments. Anne Solomon, 67, of Grosse Pointe Woods visited earlier this year and said she thought it would be nothing but cars. Word is spreading about the place. About 5,000 people came through last year including more than 1,200 for a Veterans Day event. “This is just a sharing of some of our automobiles … and our fondness for music,” Stahl said. He is the executive chairman of GroupeSTAHL, which specializes in heat printing on fabrics. Stahl, whose wife and seven children share his passion, said he doesn’t have a favorite car. He purchased most of them privately and won some in auctions. Stahl outgrew the former building that housed his collection and moved to the new location in 2011. Named the Best Realtor by the Oakland Press and also named Real Estate All-Star by Hour Magazine, William Brundage is an industry leading Realtor bringing over twenty years of experience to successfully marketing and selling fine homes and estates. His dedication to his clients and our community places him in the top 1% of Realtors. Personalized service and client satisfaction are paramount. William is committed to getting you the best price and terms in the shortest amount of time.